« Snow – We Can’t Escape It! ©Bert Gildart: Nineteen years ago today, Janie and I were married at my sister’s in Poughkeepsie, New York. Somehow Forrest, my brother-in-law, managed to obtain reservations for us at the World Trade Center where we stayed the night of May 4th, 1991. Janie and I both enjoy Broadway hits, so that night we took in CATS. As well, we dined in the restaurant once located at the top of one of the Twin Towers. Obviously we’re saddened that we can no longer return to the World Trade Center. But our sadness is obscured by the immense tragedy of lives lost subsequent to the bombing on 9/11 and the way in which the lives of so many others were forever altered. We’re reminded of the World Trade Center certainly because we honeymooned there, but also because of the recent car bombing attempt in Times Square. From the Internet, I’ve just learned that an alleged perpetrator has been apprehended. Now, if we could only bring Osama Bin Laden to justice, alive — or dead! On a more upbeat note, since departing New York and returning to Montana, our lives have been made incredibly rich with many travels, and for those interested in a sampling, simply click on the months located in the archives to the right of this post. A few highlights might include experiences in the Arctic (boating Adventure) and the travels throughout Canada (Kayaking Bay of Fundy) and the U.S. (Dry Tortugas) in our Airstream. We are now accepting congratulatory thoughts. This entry was posted on Tuesday, May 4th, 2010 at 6:02 am and is filed under RV Travel, Travel, View Point. You can follow any responses to this entry through the RSS 2.0 feed. You can leave a response, or trackback from your own site. Let me be the first: congratulations! We’ve been married 16 years so we’re not far behind you. As far as I know, nobody has felt so upset about it that they’ve felt obliged to blow up the place we got married. Congrats Bert and Janie! Why not post a pic from the wedding? p.s. I’m an hour from Poughkeepsie NY! Sandi and I wish you a happy anniversary. We’re rapidly approaching our 23rd, not counting our “practice” years before. But then, who’s counting! As I’m sure Sandi told you, we were married in the St. Cloud, MN courthouse during lunch break for a murder trial while we were on our way to MT (good Ju Ju). Your’s still trumps! May you enjoy many more years together wearing out that new transmission. Happy anniversary to you both! You know, in all my travels you’re one of my favorite two people that I’ve met. And I always enjoy visiting with both of you. Good work on sticking together through many years! Wonderful Blog! Happy Anniversary! 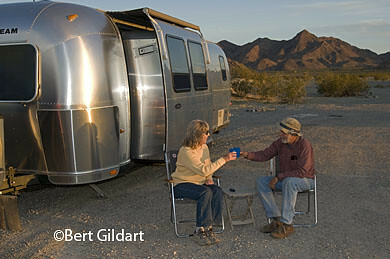 What a beautiful airstream. Looks like your living my dream. ;+) Some day I would love to get a trailer and travel around. I live in Beautiful Montana as well where the snow just keeps a fallin. True Spring, will definitely be a welcomed sight. Happy Anniversary! My husband and I went through a drive through wedding chapel in Las Vegas. It was a day of laughter that we will never forget. Cheers to many more years of wedded bliss.